Happy Dog Ranch is home to a wide variety of hoofed animals including horses, ponies, donkeys, a mini-horse, alpacas, goats of all sizes, a llama, a miniature steer, a sheep and a pig. We also have chickens, cats, dogs, and lots of wild visitors. 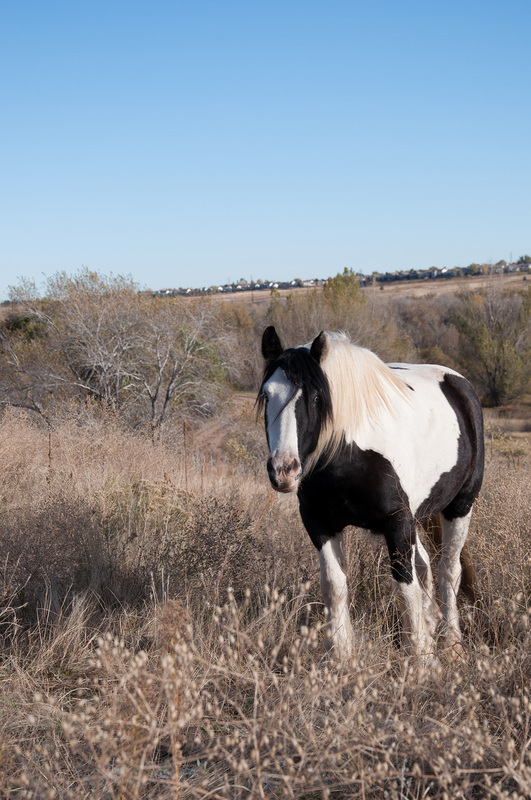 The horses, ponies, and donkeys that live at HDR are divided into three distinct herds. By giving them the opportunity to live in a herd situation, not only are we providing them much needed security but also a rich and varied social life that fills their days with play and a wide range of sensory experiences. A special thanks to Carol Walker, Maegan Leake, Laura Sosalla, Trish Barker, and to Renae Pick for providing photos of all of our special animals. 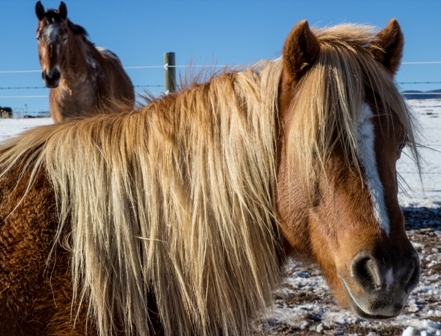 Alya is a beautiful 24 yr. old, Haflinger Pony cross, with all the intelligence that breed characterizes. She adores children, and can often be found with young rider on her back or schooling our volunteers. 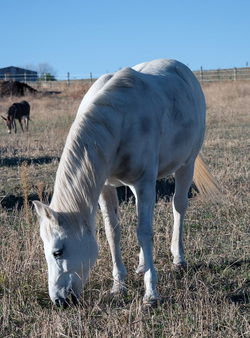 Dtsara is a 24 yr. old Arabian, who arrived here with her half-sister, Pliska, and her son, Zeus, when their pasture was threatened from the Black Forest Fire, in 2013. She and her sister are inseparable and you can always look for them side-by-side eating hay or out in pasture. She adapts well to new situations, and is always ready to learn. Sponsored by Karell & Phil R.
Lola has been with us after her barn burned down. She’s a sensitive Appaloosa lady, and likes to be asked gently to be groomed and have her feet cleaned. She is the defender of both Ayla and Stormy, and will not put up with any bullying on either. Stormy was a therapeutic donkey for a child with Asperger’s, before we brought her here to HDR eleven years ago. She is a gentle lady and will quietly walk beside you wherever you want to go, without a halter and lead. She now shares her days with her pony buddy Alya, hanging out and eating hay. Shirley is 25 yrs. old, and has been with us since she was 16. A former barrel racer who was retired because of an injury to her suspensory ligaments, she was used as a broodmare for a number of years. She’s been Iris’s adopted mother since weaning, and holds a special nurturing place in her herd. Sweet Pea is one of our newest additions to the HDR herd. Though we're still listening to all the stories she has to tell, we do know that she's an absolute sweetheart and is very willing to learn all about how we do things around here. Knox has been working with her in the round pen, and we hope to soon put a saddle on her soon to see how much she has learned previous to her arrival. Plus she's getting spoiled rotten with lots of massages and energy work everyday. Cactus is an elderly Donkey gentleman, who came to live at HDR with two other senior horses, several years ago. Both have since passed, but Cactus is still going strong, and herd life keeps him young-at-heart. He likes the ladies (Sheba is the apple of his eye), and is quite the talker once he gets started. Gryphon came to HDR for a short visit, but ended up staying after his owner decided that we were the best place for him. A 18 yr. old OTTB, he is the lead gelding of his herd, and a consummate gentleman about all of his duties. Gryphon has a lot to give to anybody who listens. Pliska is 26 yrs. old, and like her half-sister, Dtsara, is still not quite sure about life outside the herd, but that doesn't stand in the way of her sweet Arabian disposition and a willingness to give her all. Her son, Zhum, was one of John and Bernadette’s first horses, and the inspiration to start Happy Dog Ranch. 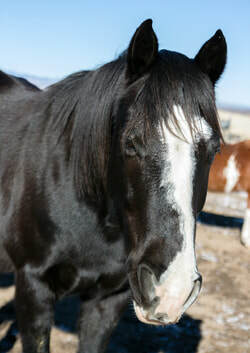 Ranger is a 18 yr. old American Paint gelding, who came to us from Marble, along his pasture-mate Toby. 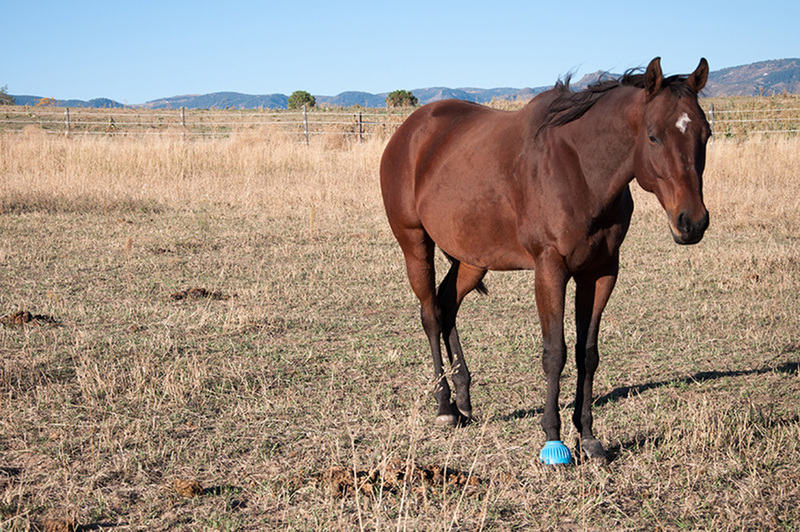 Still recovering from injuries sustained in a tangle with a barbed-wire fence, Ranger is taking part of our restart program, and we hope we’ll be able to get him under-saddle this summer. This beautiful 21 year old retired endurance Arabian has caught the eye of Shirley, who is in the throes of a schoolgirl crush with his handsome guy. He's not quite sure of all the attention, but that's okay; he has lots of admirers in human form. In fact, he was adopted by one of our volunteers just months after arriving. Dinah is HDR’s ambassador. A 21 yr. old Gypsy Vanner mare, she was known for pulling the carriage of the king and queen at the Colorado Renaissance Festival. She was bought at auction along with her colt Fionn, who was six months at the time, and while she was in foal with her other colt, Embarr. Dinah is our go-to horse for visitors, groups, and anyone who want to know what Happy Dog is all about. Iris was bred and born here at the ranch, and is spoiled rotten by the HDR staff and herd. A 5 yr. old Axteca, out of our American Paint, Rain, Iris can be a handful like most horses her age, but she is an eager learner, and spends most days working with Gray under-saddle. We are all looking forward to watching her grow-up the Happy Dog way. Qamar boards at HDR, but this handsome Arabian gelding is really just one of the guys, and when he’s not being trained by Gray, he’s playing the practical jokester on his herd-mates, or his owner Kathleen’s Horse Hungry group. Toby is Happy Dog’s oldest resident at the ripe age of 37. From what we’ve heard, he pretty much hoof-raised every cowboy in the Marble area, and was going strong until he was finally retired a few years ago. Toby has lots of admirers, and always has a nicker for passers-by, especially if they have his food. Levi has charmed all of us, even his pen mates Ayla and Stormy, with his big horse spirit. He came to us with a winter coat so full that it could have covered three regular sized horses, but after spring had sprung, and that mountain coat groomed out, we realized that there was a good-looking guy underneath. Levi is 23 and has the moves of a horse half this age. He's still requiring lots of softness, but he's finding that working with our therapist Megan is a rewarding job. 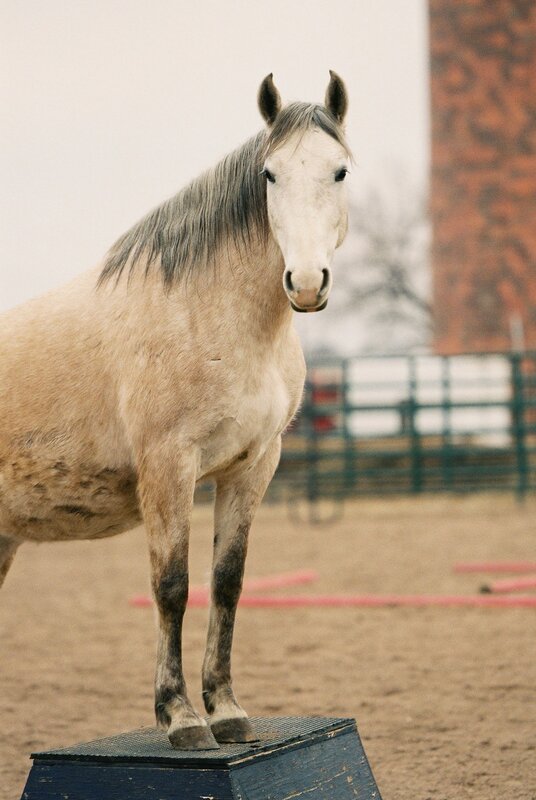 Cloud is a beautiful 19 yr. old Quarter Horse mare with Wobbler Syndrome, but that doesn’t deter her a bit. She’s a great teacher for any new volunteer who needs to learn patience, and is always up for a massage and a post-grooming carrot. Jewel came to HDR with a troubling past, but brought with her a healing nature and a need for human touch. 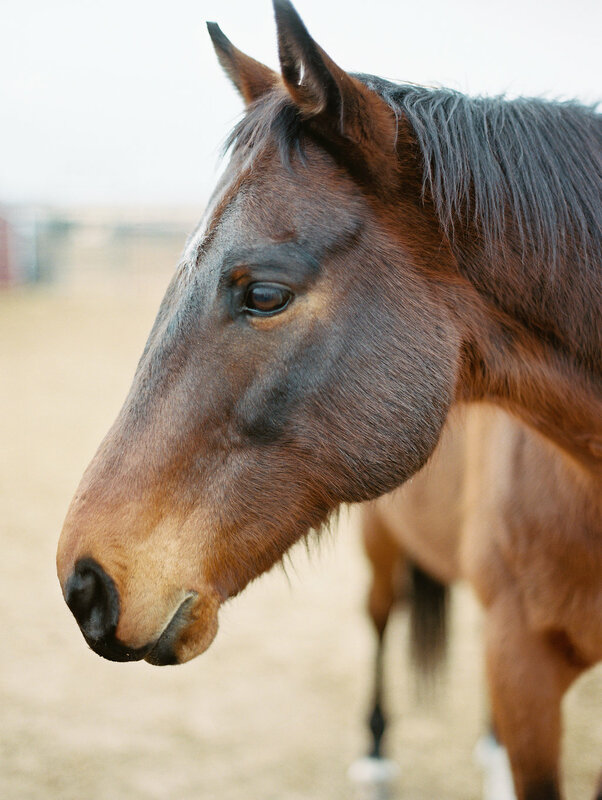 A 15 yr. old Thoroughbred, she reminds us all what Happy Dog Ranch is all about, and why we’re here. Hollywood is a favorite among HDR staff and volunteers. 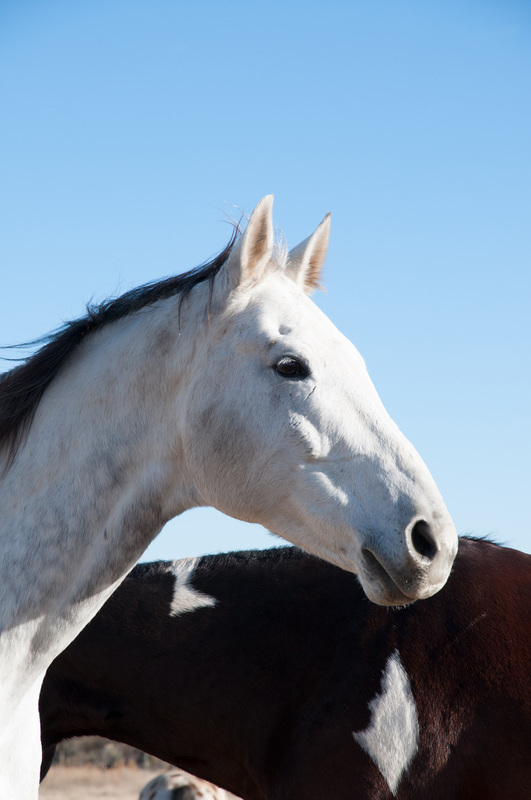 This Solid Paint-Bred, 16 yr. old beauty has a beautiful heart too, and is our go-to horse for riders of all ages. Always up for a nuzzle, Hollywood loves to be loved on, and will cross the pen if you call her. Lil, a 15 yr old Mangalarga, arrived here with Gray. Though she likes to hang out with Hollywood, Roxie, and Gracie, she also likes some quiet time and is often located sunning herself in one of the sheds. Summer is a flaxen-haired beauty who has quickly become one of the most requested horses on our volunteer horse assignment roster. And though this feisty, independent lady has a whole chapter about her (as Lily) in Mark Rashid's newest offering Finding the Missing Path: The Art of Restarting Horses, fame hasn't affected her in the least. She's down-to-earth, and is always willing to make time for her fans. Roxie is Comet’s lead mare, and he is never far from her side. A flashy liver chestnut Morgan, Roxie is a favorite of our riders, who all note her smooth trot, which is especially nice to middle-aged backsides. 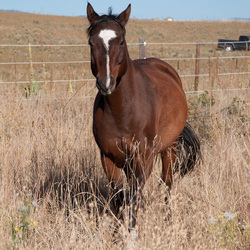 Sheba is a 28 yr. old retired Quarter Horse brood mare, who’s a member of Comet’s “bay” club, and can always be found next to Jewel, another member, either at a hay bale or in the pasture. 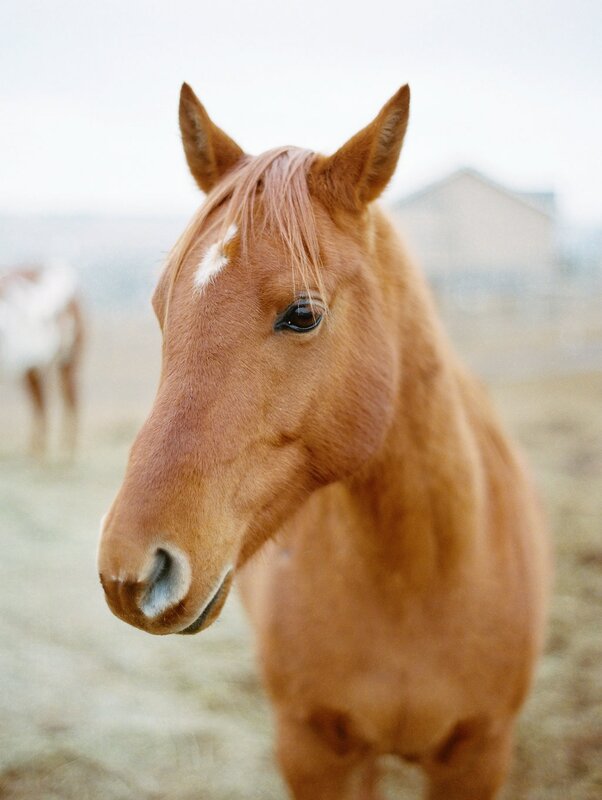 Her sweet nature has made her a favorite of our “Horse Hungry” volunteers, who all request her during their visits. 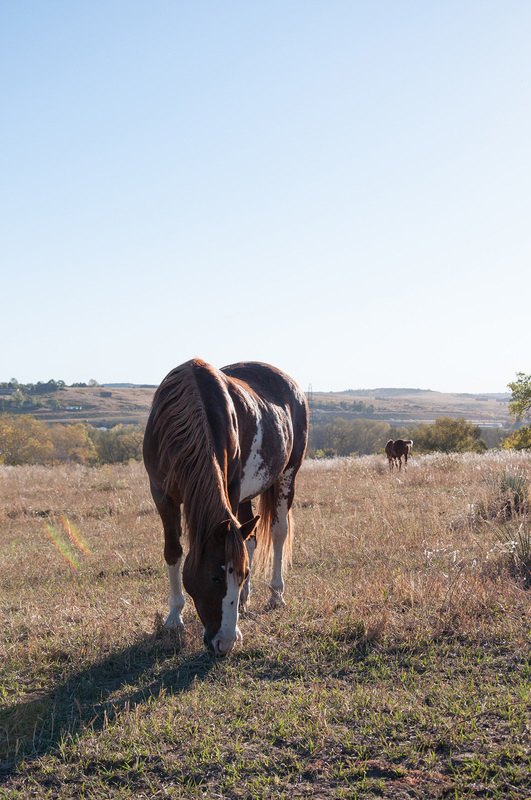 Comet, a "young" retiree from a local dude ranch, made his way to HDR, where he not only leads our largest herd, but also is considered the top gelding when all three herds are in pasture together. Comet is always craving a good bottom scratch, and staff and volunteers are always wary of face-to-tail encounters. Indy is a 25 yr. old Arabian mare, who is HDR's cover horse. If there’s a picture, Indy is in it – looking perfect every time. 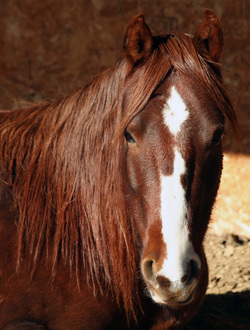 Her sweet nature makes her best horse to introduce eager, but green volunteers the basics of grooming. She enjoys a game of hide-and-seek during the summer months, and can usually be found behind the barn, cooling off. Kiwi is another member of the HDR Morgan society. This 16 yr. old suave man about the herd, can always be found by the side of one of our lovely ladies, especially Sheba or Sandi, making them feel extra special. Kiwi is John's horse of choice, and they travel all over the state to attend trail rides and other events. Sedona is our big red love bug. A Thoroughbred/Lusitano mix, she has been at HDR for just over 2 year, and just recently decided that she was tired of living the single's life, unhooked her run's gate, and joined Comet's herd. With Gray, she is becoming a confident and graceful pleasure horse. Zhum is the horse that started HDR. A 18 year old Arabian gelding and son of Pliska, Zhum was an anniversary gift to Bernadette from John, and the rest was history. You can always find him leading all the herds in from pasture at full speed, with his head and tail up high. Frisco came to us as a yearling, and can always be found in the middle of herd happenings, whether it’s playing chase or bitey games, with our older horses. He is also quite “neigh-borly,” and likes to hang out with his buddies in Gryphon’s herd. Gracie is one of HDR’s four Morgans and Roxie’s second in command. Lovingly referred to by staff, as the “Big Orange Pumpkin,” because of her solid chestnut color, she’s our number one teacher of boundaries for new volunteers. She's also quite musical and likes to hum during walks and rides. Jackson is an inquisitive Morgan gelding, who always wants to lend a hoof when there’s mucking to be done. 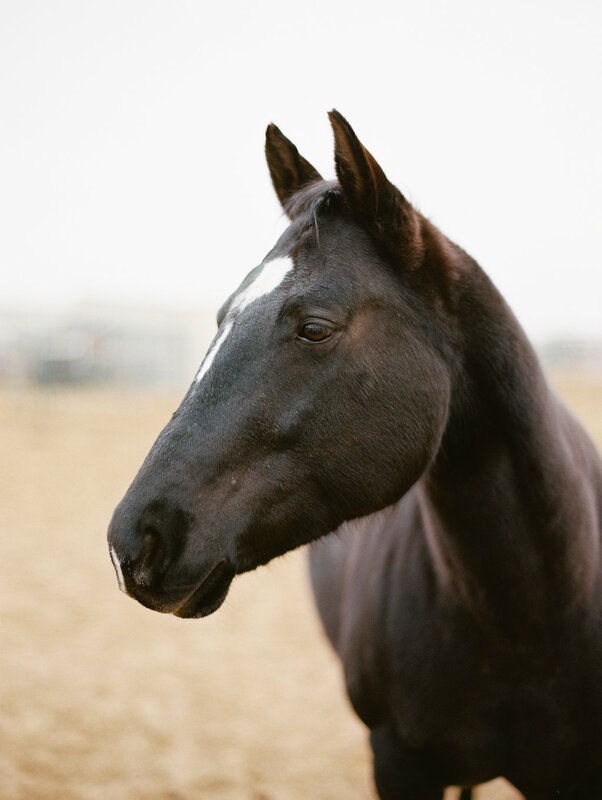 A true helper-horse, “Jack” is always giving encouragement, and expecting a little love in return. He’s also a favorite of our visiting clinic students, and has a fan club overseas. 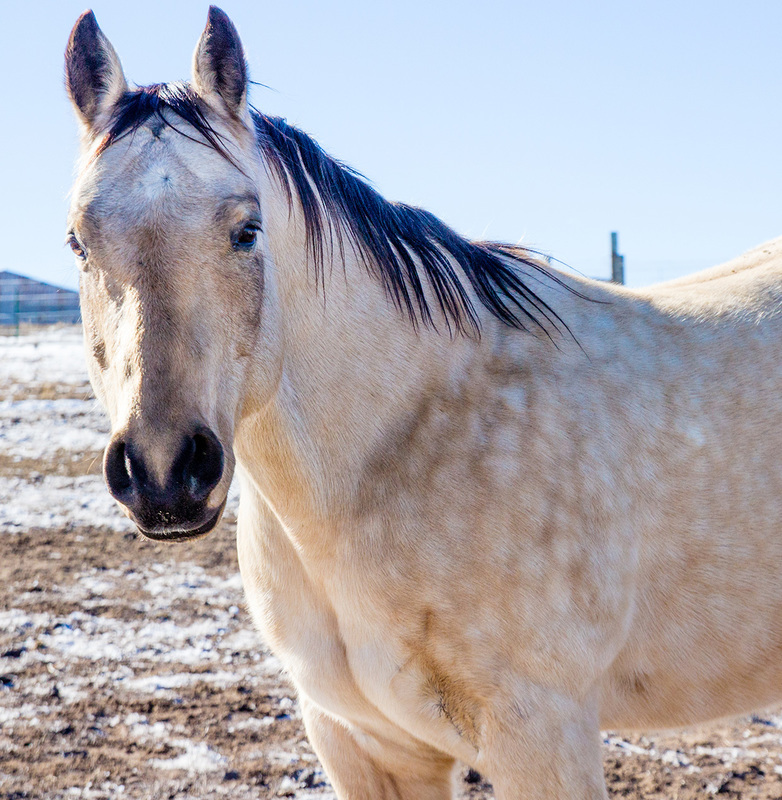 Jasmine is a petite 18 yr. Quarter Horse and former cutting horse, who has become a surrogate mom to a much larger young boarder, Arwen ( a Draft-Appaloosa mix) here at HDR. Her strong mothering skills keep the youngster in line, as well as the rest of the herd. "Though she be but little, she is fierce" is a quote that comes to mind, but don't let that fool you - she's a sweetheart to groom and a peaceful companion to share a quiet moment with. 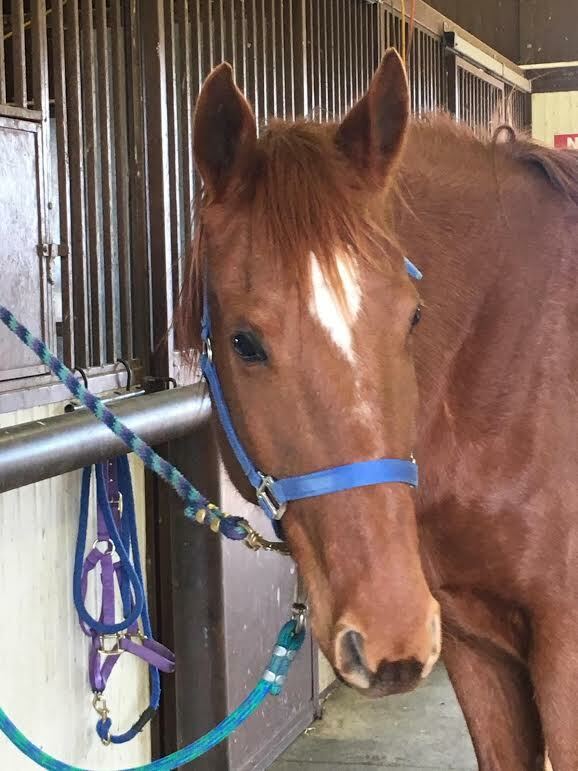 Kibwezi might be our most playful “youngster.” A 13 yr old Arabian gelding, he is always looking for someone to race with, and can usually be found harassing one of the older geldings into a game of chase. Sandi, an Arab/Paint mix, is our newest addition. Still recovering from injuries from an accident, she is finally finding her way in the Comet’s herd, and can always be found next to Kiwi, who keeps an eye on her. 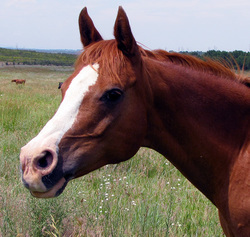 Embarr is one of HDR’s Gypsies and was born here at the ranch in 2010. He and his big brother, Fionn, are inseparable, and keep us hopping with their antics. Can’t find Fionn’s feed bag? Embarr is standing on top of it -- every morning. Mick was one of Mark Rashid’s clinic horses, who was retired early because of an injury, and we asked for him to come live with us. A 16 yr. old buckskin QH, we often find Mick and other lead gelding, Comet, with their heads together comparing notes on herd management. Socorro is our man for all seasons. This gentle giant had all our volunteers’ clambering to be his “person,” but Barb won his heart. A 19 yr. old Andalusian gelding, Soco loves to be the last one in from pasture, and usually likes to take one more roll, before he goes in the gate. There's always a new volunteer standing over him, trying their hardest to get him up. Fionn was six months old when he arrived here with dam Dinah, with little brother Embarr, soon to be born. Fionn is HDR’s perpetual Gypsy bad boy, who can melt any heart with his beautiful blue eyes, and hipster mustache. Windtalker came to us tired of the show ring, and ready for the Happy Dog way of life. A 19 yr. old TB/Warmblood mix, he told us early on that he would welcome a mare in Mick’s all gelding herd, and finally found love when Rain chose to be a part of it. 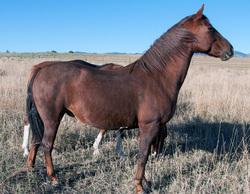 Zeus is a 11 yr. old Arabian gelding, whose dam, Dtsara is also part of the HD herd. 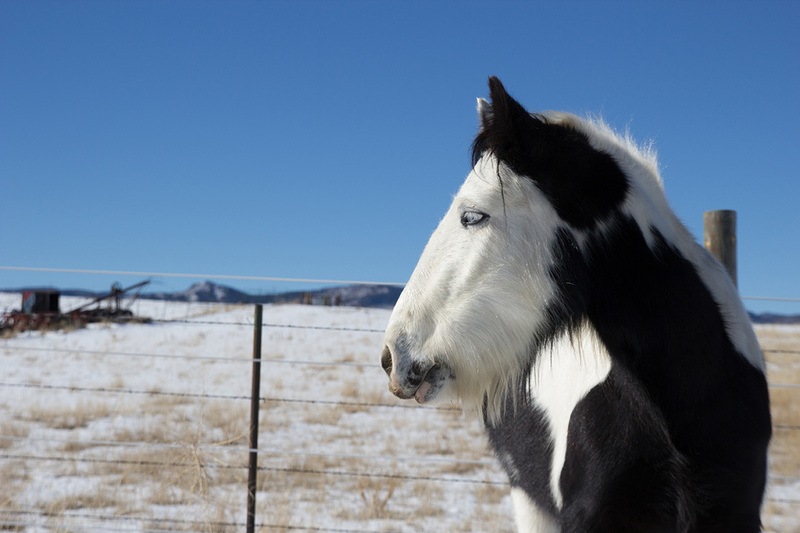 He came to us when his pasture was threatened by the Black Forest Fire, over three years ago. He’s now the perfect pleasure horse, compliments of Gray, and is a favorite of Mark Rashid's clinic attendees. Harpa is an Icelandic, who decided this last fall to muscle herself into Mick’s herd, and become lead mare to a bunch of bachelors. She is the portrait of the Icelandic breed, down to her gaited trot, which was recently highly complimented by a rider who is an expert on the breed. 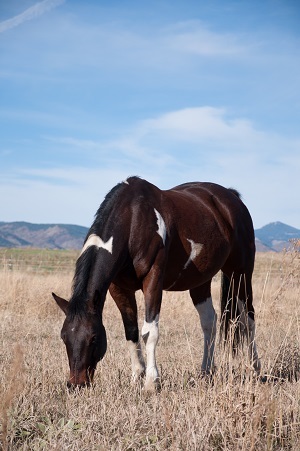 Patches is a 24 year old American Paint who marches to his own tune. Solid and dependable, he strolls along, always doing his own thing and is happy doing it. A patient teacher, Patches can always be found with our visiting classes, teaching horse care and grooming. Rain is a 2 2yr. old American Paint, and dam to Iris. This feisty girl can have her pick of gentlemen callers, but you can still find her sharing a salt-lick with Comet. A volunteer groundwork favorite, Rain is an expert at putting them through their paces. Many thanks to Mila for her sponsorship of our ducks and to Delores for her sponsorship of Wilbur and our chickens.